Hi Daniel, It is with great pleasure that I am writing this for you. Secrets to Dog Training was great! We have a crossed breed Poodle/Terrier and training him is extremely important to us since we live in high rise apartment. 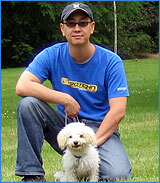 Secrets to Dog Training's methods are positive and very proactive. Sumo, our pup, is doing great! At only 5 months old he sits, lies down, heals, stays, and even comes most of the time. We can not expect too much at his age but he is getting better everyday. Secrets to Dog Training continues to provide support through email which we feel is a priceless resource.